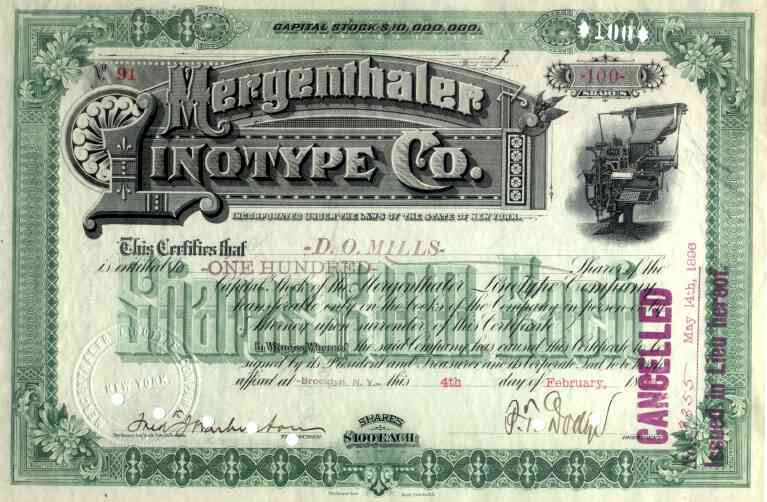 1896 Mergenthaler Linotype Co Stock Certificate signed P. Dodge. Attractive scripophily document with vignette of linotype machine. The Mergenthaler Linotype machine revolutionized the publishing industry by allowing lines of metal type to be set from a keyboard similar to a typewriter instead of each piece of type being set by hand. Philip Dodge (1851-1931) was a patent lawyer with a deep understanding of technological innovation. He was an attorney for Remington Typewriter Co and eventually became president of Mergenthaler Linotype. He also was president of International Paper, Royal Typewriter Co, and Columbia Gramaphone Co. This scarce antique stock certificate is in VF+ condition.